If you want to make smoothies, mixed drinks, milkshakes, or puree food you will want a good blender. The good news is there are models available for purchase that fit any budget – from less than $50 to more than $500. For this article we are going to focus on blenders that cost less than $500. This is one appliance that most people leave on the countertop so appearance and size matter. However, even more important is the capability of each machine. How well does it blend, crush ice, or puree and chop food? In order to get passing grades for each of those tasks it needs a good design, sharp blades, and plenty of power, as measured in watts. Other key factors to consider when shopping for a new model include ease of cleaning, multiple speeds and controls, pitcher types, noise, and durability. If you need more help see our blender buying guide. The following is our review of the top 10 best blenders. Below the blender reviews we also provide a comparison chart so you can easily compare one blender versus another. We selected the Vitamix Pro Series 300 as the best blender. This excellent performing blender comes with a price of$429.99 and scored the highest rating by the leading consumer magazine. Powered by a 2.2 peak hp, 1656 watt motor it has 10 speed controls, 4-inch diameter stainless steel blades, BPA free 64 oz container, and is surprisingly quieter than most other models. This unit performs almost flawlessly through any task including making smoothies, crushing ice, making peanut butter, or blending soups. About the only downside is that it does not have preset controls, but if you want that you could spend $170 more to step up to the Vitamix Pro Series 750. Overall we highly recommend the Vitamix 300 for all users especially avid cooks who demand the best. It has no weakness, but it does cost a lot of money. If you only want to make smoothies or are only going to use it occasionally then you can get away with a more affordable option. The $379 Vitamix 5300 is an updated version of the venerable Vitamix 5200 which has an almost cult-like following and won numerous awards. The differences include an upgraded 2.2 hp motor, a shorter 64 oz BPA free container, and a pulse setting. These changes make the 5300 very similar to the Pro 300 although the base is slightly different and the Pro 300 is quieter. Performance wise the 5300 is almost identical to the Pro 300 – it blends smoothly and effortlessly and the added pulse setting gives you more control than the 5200. You also really notice the differences in the 10 speed settings unlike some cheaper models – 1 is really slow and 10 is really fast. 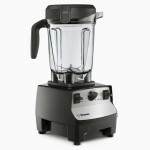 It is backed by a 7 year warranty so you can buy the Vitamix 5300 without worries. We recommend it for serious uses, but since it is expensive if you will only use a blender occasionally then you might consider a cheaper option. 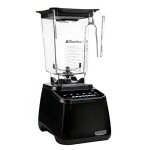 The $409 Blendtec Designer Series Blender is sleek and powerful. It features an awesome 1560 watt, 3 hp motor with pre-programmed blending cycles and illuminated touchpad controls. It is less than 16 inches tall and has a 64 oz BPA-free Tritan blending jar. This Blendtec unit is not lacking for power, but it does not have a tamper and it can be somewhat difficult to get the right consistency when preparing food that is not pre-programmed. However, it does excel at smoothies and blended iced drinks. In testing it produced the smoothest smoothies of all the blenders on this list. The main complaint about this unit is the noise. 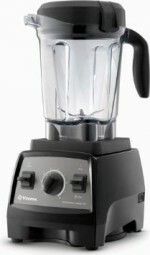 All blenders are noisy, but this one is the loudest of the models on this list. You should buy the Blendtec Designer Series Blender if the way the appliance looks on your countertop matters to you and the primary use will be for making smoothies several times a week. If price, noise, or more versatility are of a concern to you then you should consider a different model. 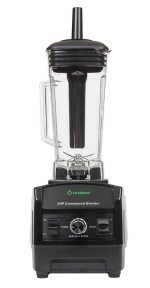 The company Cleanblend has only existed for a few years, but they make an outstanding blender with their Cleanblend Commercial Blender which sells for about at $199. We think it is the best blender under $200. It takes its design cues from Vitamix with a simple dial speed control with no presets and a pulse lever. It has a BPA-free 64 oz container. At the heart of this appliance is a 3 hp, 1800 watt motor which provides excellent processing power. When blending fruit smoothies in testing it is one of the few machines that could process berry seeds which results in restaurant quality smoothies and mixed drinks that are second only to the Blendtec. However, the difference in speed settings is negligible and the motor seems to produce a lot of heat which makes it tough to get the right texture on certain foods. It is also a bit taller than some other models so storage might be an issue. You should buy the Cleanblend Commercial Blender if you want super fine smoothies or mixed drinks and don’t need to use it for many other tasks. The Dash Chef Series Digital Blender gives you similar power to the top-tier models at a much more affordable price of around $200. This appliance is recommended by the leading consumer magazine. 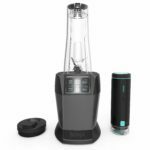 It has a 1400 watt 2.25 hp motor, a 2 liter BPA-free Tritan jug, and a digital point and click interface including six preset functions – rinse, puree, soup, smoothie, crush, and frozen. Some may find the digital interface convenient, but others might miss not having dial controls. The performance is quite good, but maybe just short of Vitamix and Blendtec. It makes smooth smoothies, but does not handle lots of ice all that great. The puree tests were excellent and it is relatively quiet. One of the main downsides is that it is really tall – 22 inches – and might not fit well under your cabinets. Overall the Dash Chef Series Digital Blender offers outstanding performance for the price. We selected the Nutri Ninja Blender Duo with Auto-iQ BL642 as the best blender under $150 with a price tag of about $147. This thing has received high marks from user reviews and from the leading consumer magazine. It uses Ninja’s new Auto-iQ technology which features preset blending programs for things like smoothies, food puree, and blending with no guess work on your part needed. In testing smoothies were very good, while ice crushing and purees scored just a touch lower. The BL642 has a 1200 watt, 2 HP motor along with extractor blades to break down fruits, vegetables, seeds, and pulverize ice to snow. It also comes with a 72 oz pitcher and 3 other different sized cups with Sip & Seal Lids for smoothies on the go. Overall the performance is not quite up to par with the more expensive blenders, but if you don’t want to spend more than $150 then the Nutri Ninja Blender Duo with Auto-iQ BL642 is an excellent choice. The best value buy and best blender under $100 goes to the Ninja Professional Blender 1000 BL610 which sells for just $67. We graded the smoothie performance a B, while ice crushing received an A. Smoothies made by this blender tend to be smooth, but still have some small bits not completely liquefied. The BL610 has a 1000 watt motor with 3 different speeds and a 72 oz capacity plastic jar. It relies on sharp blades to chop and blend, but they can go dull over time – especially when chopping ice or frozen fruit. For the price, we feel the Ninja Professional Blender 1000 BL610 is a great buy. However, it does not compare to the more expensive, top-tier blenders on this list. It is also available at Walmart.com. The $89 Nutri Ninja Blender with FreshVac Technology BL580 has a truly unique feature that stands out. The FreshVac Technology, as Ninja calls it, is a vacuum pump that removes the oxygen from your food before you blend. This results in longer lasting drinks, shakes, and smoothies with better flavor, less foam and separation. You can blend up a concoction then store it in the fridge for about a week before it turns brown. Users should be aware that the pump runs on batteries. The BL580 has an 1100 watt motor with 2 speeds and comes with two 24 oz single-serve cups. The regular blending performance we would describe as good, but not outstanding. It also is really loud. The Nutri Ninja Blender with FreshVac Technology BL580 is for someone who wants freshness and less foam in their drinks. You are limited in how much you can make at one time to the 24 oz cups. 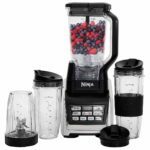 However, if you want a full size countertop blender with the FreshVac Technology then consider the Ninja CT661V which was picked as a Best Buy by the leading consumer magazine for about $150. The Ninja Master Prep Pro blender is our best cheap blender under $50 with a price tag of about $45. This model comes with 3 different containers and has a 450 watt motor, which is below average, but it still scored quite well in blending and making smoothies. One great feature on this appliance is that you can remove the blades and scoop out all the contents so you don’t waste anything. This combined with dishwasher safe parts also make it super easy to clean, although the plastic jar can scratch and dull over time. The one main downside, besides being down on power, is the lack of different speeds. There is only one speed so getting the right consistency might be difficult with a variety of ingredients. It also feels a bit cheap and we suspect will not hold up as well as the more expensive models. This thing really is surprisingly good for this price. 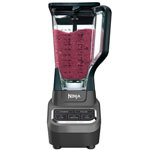 We recommend this Ninja QB 1004 for all users looking for a cheap blender that will be used occasionally, although for daily use or gourmet chefs you might want to spend more for a model with more power and controls. 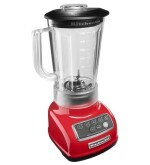 Another blender that is available for under $100 is the KitchenAid KSB1570 5-Speed Blender. Selling for $79, this 16-inch tall KitchenAid model doesn’t do anything amazing, but it does provide decent all-around performance while still being quieter than other models in this price range. It has 5 speed settings along with pulse and ice buttons and a 56 oz BPA-free pitcher. No it is not as powerful as a Vitamix or even some Ninja blenders, but it can blend foods well – just don’t expect super fine smoothies. 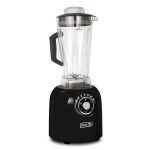 The KitchenAid KSB1570 is for those you looking for a budget or cheaper blender for occasional use. If you plan on using it everyday you really should invest in a more expensive, better quality unit. Here are some items to look for when shopping for a countertop blender. Get a model that does what you want it to do. If you are primarily going to make smoothies, get one that excels at doing that. If you make mixed drinks, or need to crush ice then make sure it has enough power to handle that task. If you will be pureeing and chopping food you might need more speeds or controls to get different textures and consistencies. We recommend reading customer reviews to judge how well a particular model does at each task. You might be able to save money if you buy a blender that is job-specific, whereas one that excels in all areas will cost you more. The wattage measures how much power the appliance has. Lower end models will have between 300-600. High end appliances may have 1000 to 1500 watts or even more. But higher wattage does not always mean a better machine. The overall machine design and blades also have a serious impact on how well they perform. Also for certain foods a lower watt model may actually be preferred. The options available for the container include plastic, glass, and stainless steel. Glass is more stable in use, easier to clean, more durable, and you don’t have to worry about plastic chemicals leaking into your food or drink. Most blenders come with plastic pitchers, however you should make sure they are BPA free before you buy. These can scratch and can also absorb the smell of whatever you blend. Stainless steel versions might look nice, but you can’t see how the process is going. You might find that different sized containers come in handy depending on what you are making. Some models have basic speed controls while others have programmable controls or blend cycles that automatically control the machine for you. They may be tochpad controls, push buttons, dials, or flip switch. We recommend touchpad because they are the easiest to clean. Push buttons are very difficult to clean, but are maybe the easiest to change speeds with. With a dial you have to go through all the settings before you reach the one you want. Depending on the blender, you could see between 3-16 speeds. At a minimum you want three highly different speeds. With more speed settings, the more control you have over what you are preparing, but any more than twelve and it becomes hard to distinguish between each setting. The pulse setting helps you to manually control the blender. It stops and starts it so that larger unchopped items like fruit or ice will fall down onto the blade. Pulsing a few times when you start blending something before progressing to higher speeds can make a smoother drink in less time and is easier on the blender thus extending its life. A convenient blender is one that pours easily, cleans up easily, and one that you can replace the blade easily if necessary. You should remember that these things can be very difficult to clean, so look for one that people say is easy to clean.